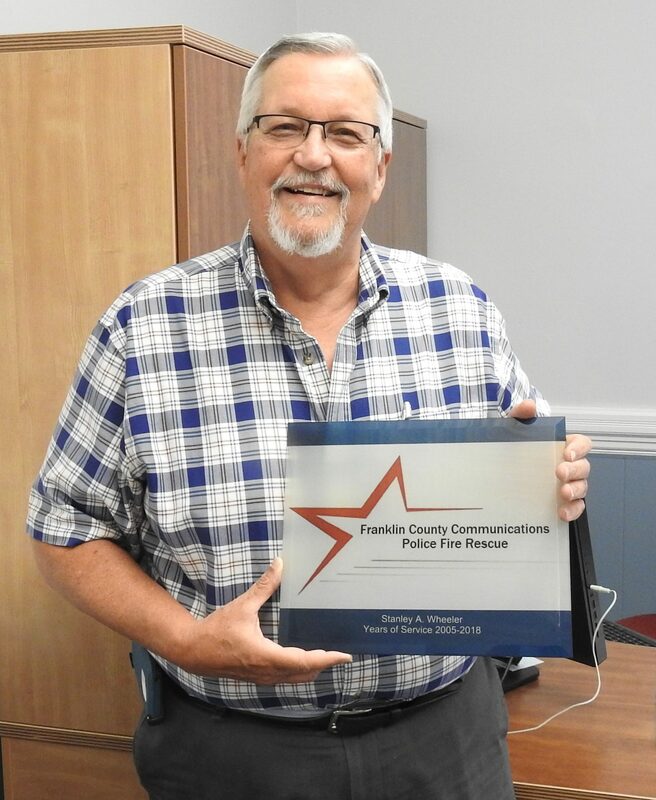 FARMINGTON - County commissioners approved vehicle bids for the Franklin County Sheriff's Office and a new mechanical services for the Franklin County Detention Center, after recognizing the former Director of Communications. Commissioners presented Stanley Wheeler with a plaque commemorating his years of service with the county. Wheeler worked with the county as a dispatcher, taking up the position of communications director in November 2013. He left the county's employ in June, with commissioners hiring C.L. Folsom to fill that position. After having the FCSO review bids from Farmington Ford and Quirk Auto of Augusta, commissioners approved the purchase of two Ford Interceptors, a type of SUV, and one F-150 Police Responder, a pickup truck, from Quirk. The total cost, minus trade-ins, was $78,944. That was less than Farmington Ford's bid of $90,811 for those vehicles. Funds to purchase the vehicles was included in the 2018-19 budget. Commissioners also approved a new service contract for the jail with Mechanical Services. The new contract includes payments to Mechanical Services, the longtime service provider, as well as Maine Controls. The combined annual cost to service the jail's systems is $12,288. The previous contract, which did not include the Maine Controls component, was roughly $6,000. The reason for the change, according to Jail Administrator Maj. Doug Blauvelt, is the modern, digital controls installed last year. The project addressed the 30-year-old HVAC system, which had become unreliable due to leaky air hoses and failing components, making it difficult for the staff to maintain the jail's various zones within acceptable temperatures. The project replaced old, pneumatic valves with digital ones to allow for great control of the system. In other business, commissioners approved expanding the Deputy County Clerk/Deputy Treasurer's job description to include additional Tax Increment Financing administrative duties. The new TIF system to support Franklin County projects will not utilize lump sum payments and a final review, according to County Clerk Julie Magoon, but instead will reimburse expenses as they come in. As a result, the office will now be processing receipts and issuing more checks. To reflect the updated job description, commissioners approved a $1 per hour raise for that position, with those funds to come out of the TIF. Franklin County receives that money as part of the TransCanada Wind Power project TIF district. Why is it the commissioners feel comfortable spending almost $80 grand on vehicles for the FCSO but not any money to the social services that reduce the need for law enforcement and lead to a safer and healthier community which can strengthen our tax base attracting new business?